Hancock, S., Anderson, K., Disney, M. & Gaston, K.J. 2017. Measurement of fine-spatial-resolution 3D vegetation structure with airborne waveform lidar: Calibration and validation with voxelised terrestrial lidar. 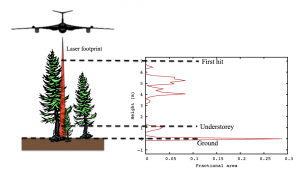 Remote Sensing of Environment 18, 37-50.
horizontal and 50 cm vertical resolution, including understorey vegetation and within-canopy structure. A new method for calibrating and validating the instrument specific ALS processing using high resolution TLS data is also presented and used to calibrate and validate the ALS derived data products over a wide range of land cover types within a heterogeneous urban area, including woodland, gardens and streets. This showed the method to accurately retrieve voxelised canopy cover maps with less than 0.4% of voxels containing false negatives, 10% of voxels containing false positives and a canopy cover accuracy within voxels of 24%. The method was applied across 100 km2 and the resulting structure maps were compared to the more widely used discrete return ALS and Gaussian decomposed waveform ALS data products. These products were found to give little information on the within-canopy structure and so are only capable of deriving coarse resolution, plot-scale structure metrics. The detailed 3D canopy maps derived from the new method allow landscape scale ecosystem processes to be examined in more detail than has previously been possible, and the new method reveals details about the canopy understorey, creating opportunities for ecological investigations. The calibration method can be applied to any waveform ALS instrument and processing method. All code used in this paper is freely available online through bitbucket (https://bitbucket.org/StevenHancock/voxel_lidar).